Premium vehicles such as those that have been painstakingly restored need premium storage. Keeping a valuable vehicle in the garage or driveway is, in most cases, not a good way to protect such an asset. Owners of classic cars, muscle cars, recreational vehicles, and even the average car that is only used occasionally gain peace of mind when they arrange storage of their vehicle in the clean, secure self-parking facility at Vines Storage. Locally owned and operated, Vines Storage is equipped with 24-hour security by means of 32 surveillance cameras and ample lighting. Owners have access to the secured property 24 hours a day via a controlled keypad entry. Our various sized units range from 5 x 5 to 20 x 20 in settings such as open parking or enclosed garage-style parking. In addition to climate-controlled indoor parking, our property also includes an area for secure outdoor parking. Even the cars we do not drive on a daily basis are an investment of our time and money. It makes sense to protect this investment with a climate-controlled unit that remains between 55 and 80 degrees year round. This controlled climate is advantageous to the function, appearance, and overall value of a vehicle. When stored indoors, a vehicle's interior, paint, and components are best shielded from harsh elements, especially heat and the sun. With specific steps, however, outdoor storage can be a suitable solution to create more space at home or store a seasonal vehicle. In addition to options for unit size and location, Vines Storage believes that options for leasing are also important. Our area of Southern California is home to "snow-birds" and year-round residents who make use of our local mountains and lakes with RVs and watercraft, or who enjoy day-trips in classic vehicles. We know that there are needs for all different types of storage, including month-to-month and long-term leases. We are happy to work with you to determine the best package. 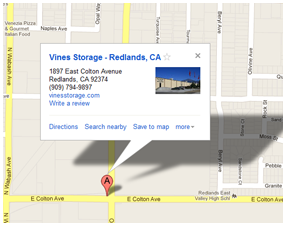 Call Vines Storage at (909)389-6209.